Previously I downloaded an interactive story app for my kids, Pilo 1. The adventures of a young boy and his pillow friend captured the imagination of my kids. A new Pilo tale is available, Pilo 3. Like previous Pilo stories, Pilo3: An Interactive Children's Story Book-3D Animation-Cooking Game is an interactive 3D tale that will keep kids wanting to play the app over and over. The story itself is simple to follow. Tommy (or Sunny, if you chose the girl character), doesn't want to eat and decides to go to bed. In his dream, Tommy and Pilo go on a adventure where they learn about cooking. As they travel, children interact with the characters as well as play games. Personally, I really like how the story uses cooking as a way to foster relationships. From making food together to sharing a special birthday cake celebration, the characters are brought together by preparing and sharing food. The lessens can be brought into our home when the kids help me prepare breakfast or we sit down for dinner. 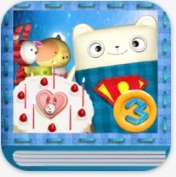 While the story is fun, my kids enjoy the games that are intertwined within the app. Each game is fun and easy to accomplish. Still, the tasks to complete the game add to the story. From cutting fruit to creating a train, the games work well with the story. By putting games into the story-line, kids don't just zone out while the app is played. When you need to keep your children occupied, an interactive story app like Pilo 3 is great option. This story is heartwarming and the kids are engaged, which is a winning combination in my book. Pilo 3 is available for iPad, iPhone and iTouch. It can be purchased in the App Store for $2.99. Disclosure. This is a sponsored review. All opinions are my own. My little niece loves to be in the kitchen. I'll have to share with my sister. Thanks! I love this!!! I love being in the kitchen with my kids! My kids LOVE apps, and the more instructional and interactive, the better! This sounds like a great app!